“Sanctuary” laws have come under recent scrutiny, as conservative leaders question whether states and localities can refuse to enforce federal immigration law. Currently, both California and Connecticut have laws called Transparency and Responsibility Using State Tools (TRUST) Acts, which stipulate that officers can only enforce immigration detainers issued by the U.S. Immigration and Customs Enforcement (ICE) for persons convicted of serious crimes. A detainer request is a formal notice by ICE to federal, state or local law enforcement agencies that it intends to take custody of detainees that ICE believes to be unauthorized immigrants. While traction has been slow on state sanctuary laws, well over 100 counties and cities throughout the U.S. have passed similar “sanctuary” policies called anti-detainer ordinances. The tragic shooting and death of Kathryn Steinle by Juan Francisco Lopez-Sanchez, a convicted felon and undocumented immigrant, sparked heated debate on these “sanctuary” policies this summer. Following this incident, the Republican-controlled House targeted sanctuary policies by passing the “Enforce the Law for Sanctuary Cities Act” (H.R. 3009), and if passed by the Senate and approved by President Obama (which is unlikely), this law would deny federal funding to cities that refuse to report detained immigrants. Conservatives have also linked this tragic incident to broader proposals for immigration reform, going as far as Donald Trump taking on a strong restrictionist position to end birthright citizenship as part of his larger plan for Comprehensive Immigration Reform (CIR). Consequential battles over future CIR are forming in the presidential election, with restrictionist rhetoric and policies receiving much attention. To balance this, I explain below how our federalist system has historically preserved state and local autonomy to pass sanctuary laws under the 10th Amendment’s anti-commandeering principle, and I explore what this means for national policymaking. Within our federalist system, there’s a long history of states and localities deciding to integrate and protect residents, regardless of their legal status under federal law. 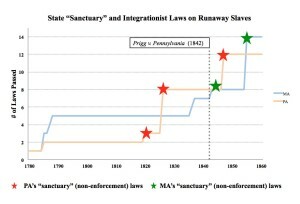 Federal fugitive slave laws made it “unlawful” for runaway slaves to be in the free north, in ways that greatly parallel federal immigration law today. 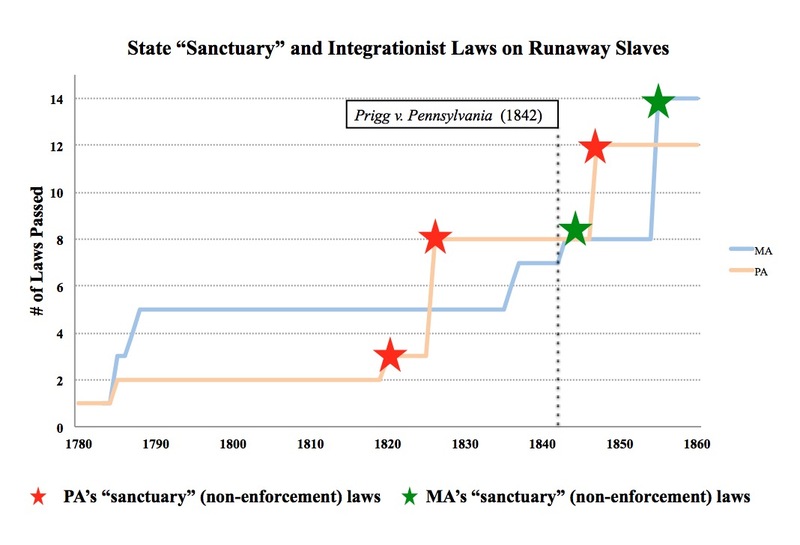 In response, some northern states passed “sanctuary” laws (see the Figure below), uniformly protecting all blacks within the state regardless of their status under federal law. This included due process protection laws that granted all blacks the rights of: habeas corpus (ensuring that a judge investigated “recaption” claims — the legal term for reclaiming runaway slaves — in a full hearing); writs of repliven (ensured that all detained blacks were brought to court); trial by jury; and giving testimony in court. Other features included anti-kidnapping laws that made it a punishable crime to remove any black person from the state without court approval. Although the Supreme Court ruled in Prigg v. Pennsylvania (1842) that Congress had exclusive power over fugitive slave laws, it also ruled that the federal government could not mandate states to enforce federal law. And so northern states passed a range of non-enforcement laws, also known as “sanctuary” laws, banning state and local officials from participating in recaption, and denying the federal government the right to use state and local courts and resources to hear cases, much like anti-detainer ordinances are used today. Still today, the federal government cannot mandate that states enforce federal law. In New York v. United States (1992), the Supreme Court ruled that Congress could not order state legislatures either to regulate low-level radioactive waste in accordance with federal instructions or to take title to the waste. Similarly, in Printz v. United States (1997), it ruled that Congress could not order state executive officials to help conduct background checks on would-be handgun purchasers on an interim basis. In NFIB v. Sebelius (2012), it struck down the provision mandating states to expand Medicaid eligibility requirements or face federal withholding of funding. Like the Supreme Court in Prigg v. Pennsylvania (1842), which ruled that the federal government could not mandate that states enforce federal fugitive slave law, contemporary courts have applied the anti-commandeering principle of the 10th Amendment to limit the federal power and preserve state autonomy. In Galarza v. Lehigh County (2014), the Third Circuit court ruled that states and localities are not required to imprison people based on ICE detainers. It also ruled that since Lehigh County, Pennsylvania was free to disregard the ICE detainer, it therefore shared in the responsibility for violating Galarza’s 4th Amendment and due process rights. The conflict between federal and state/local law is long-term. History points to the national government’s important role for securing citizens’ rights and creating constitutional floors that limit minorities’ exclusion by states and localities. These dynamics differ for undocumented immigrants. As my recent policy report with Karthick Ramakrishnan shows, California is leading in a new approach, passing laws that grant undocumented immigrants access to state driver’s licenses, in-state tuition, financial aid, health care and professional licenses, and that shield them by limiting state participation in enforcing federal law. It is unlikely that CIR will solve the concerns of states like California, and it is equally unlikely that the federal government will resolve this conflict by pushing to remove “unlawful presence” from immigration law. Historically, northern state laws conflicted with federal fugitive slave law, and national change occurred only as the result of north-south tension on slavery hitting a violent tipping point. After the Civil War and over six hundred thousand deaths, Congress passed the 13th and 14th Amendments, securing freedom of movement for all blacks (removing blacks’ unlawful presence). California’s model today illustrates how our federalist system empowers states and localities to provide life-changing rights and protections to undocumented immigrants, who have no alternative recourse, and this is conflict between federal and state/local law is escalating with no foreseeable tipping point. The question then becomes: How do political actors navigate federalism’s dual and conflicting legal systems, and the multiple pathways – national, state and local – for pursuing policy change? While CIR has potential to increase (or decrease) immigrant rights, it cannot replace integrationist and protective roles developing in states like California, whose capacity of inclusion is uniquely more expansive than the national level. And this institutional flexibility found in our federalist system is arguably good for American democracy.